The Untouchables stunned the Tornados by erasing a 0-2 deficit in the quarterfinal best-of-five series and advancing to the semi-finals for the first time since 2005. In game three on Saturday Paderborn celebrated a 4-3 win thanks to a walk-off RBI single by Jendrick Speer in the bottom of the ninth overcoming a 1-3 deficit in the process. Sascha Brockmeyer had tied the game with a two-run single in the bottom of the sixth. After rain delayed the start of game four, the U’s took full advantage of a wild Philipp Hoehlein and crushed Mannheim 10-0 in seven innings to even the series at 2-2. In the decisive fifth game on Sunday the Tornados actually had the better start and took a 6-2 through five innings due to homeruns by Sascha Lutz and Matt Lokken. But it was not enough, as Paderborn slowly got back into the game and completed the comeback with a big five-run rally in the eighth to win 11-8. A bases clearing double by Bjoern Schonlau sealed the win. The Buchbinder Legionaere had to go through four games to hold the Stealers down and to clinch their spot in the semi-finals, where they will face the Paderborn Untouchables. 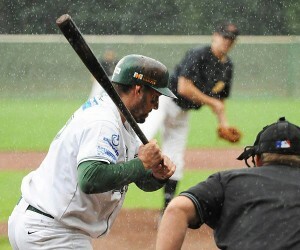 In game three on Friday evening the HSV celebrated thrilling rain-lengthened five-plus hour win. A bases loaded walk by Patrick Maat in the top of the first extra inning sealed the 5-4 win for the guests from Hamburg. Earlier in the game Regensburg had erased a deficit three times, including on a RBI double by Ludwig Glaser in the bottom of the ninth. Maat also hit a solo homerun in the opening frame. Jerome Rousseau had a two-run double for the Stealers. Regensburg’s starter Boris Bokaj only lasted a few pitches before leaving the game with a rib injury. In game four on Saturday afternoon the Buchbinder Legionaere scored in six of the seven innings to win 11-1. The game ended on a two-run homerun by Chris Howard due to ten-run rule. Ludwig Glaser and Matt Vance each scored twice. Eric Faint went the distance, allowing just one third-inning run on six hits. Defending champion Heidekoepfe beat the Capitals 8-5 on Saturday and swept the best-of-five series to get into the semis. Four runs in the bottom of the fifth for a 7-3 lead decided the outcome. Simon Guehring broke 3-3 tie with a solo homerun. 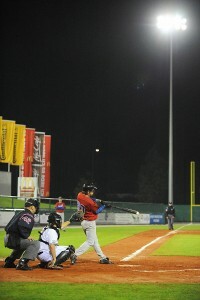 Christian Nsien homered twice for Bonn to drive in three. Matt Pali and Michael Weigl collected three hits each for Heidenheim. Markus Winkler struck out eleven batters in eight innings, allowing five runs on ten hits and three walks. Tim Henkenjohann took the loss. The Alligators had to overcome a 0-5 deficit against the Disciples to win 9-5 and to celebrate the sweep in the best-of-five series. They will face the Heidenheim Heidekoepfe in the next round, a rematch of last year’s semi-finals. On Saturday Haar had the better start and already looked towards a game four, when they led 5-0 midway through the fourth. But Solingen cut the deficit to three runs in the bottom of the fourth and put six runs on the board one frame later to decide the outcome. A two-run triple by Patrick Kanthak highlighted the big rally. Andre Hughes received the win, Gregor Klinc the loss.